One really cool thing about China and Taiwan is foot massage. In Chinese medicine it is believed that the foot is connected to all of your organs. For example, a certain region in your foot would be connected to your brain. Foot massage is pretty common in China and Taiwan. You'll find foot massage parlors and people who will do it out on the street. I used to visit a man who did it out on the street in Taichung nearby my house. Another good thing about it is that it is cheap. It depends on the person. Some will just take it easy on your feet and do just a gentle massage. And others will really get in there and work hard on the sore spots. It can be quite painful at times, but the reward comes at the end. Your feet will feel very alive. They'll feel very warm and it's as if you're able to feel the blood circulating throughout your feet. There are also walkways in parks that have small smooth rounded stones positioned in certain ways. These are for foot massage. You take your shoes off and walk on them. The stone ones can be a little painful at first. Many Chinese believe that if it's painful then there is possibly a problem in your body. I did find something in Taiwan that I didn't find in China. 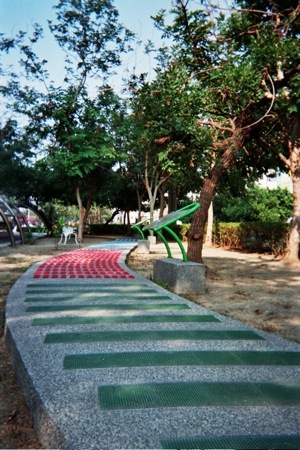 In Taiwan you will also find a more modern version of the stone paths for foot massage. They make similar ones of different shapes and sizes out of plastic. You can see what I mean by looking at the photo. In the foreground you will see the strips of green. Those have small little rounded spike thingies on them. They're not sharp and they also make some sandals that have those things on them. It feels good to take your shoes and socks off and walk on them. And as you look down the path you can see (not so well) different shaped features for foot massage. Some of the other shapes were big and round or rectangular. So these like the stones can also be found in parks around Taiwan. So if you're in Taiwan or China I definitely recommend getting some foot massage done. You might want to try out a few different masseurs until you find a good match. And don't be afraid of a little pain.